An unfunny comic rides an unfunny joke to spectacular fame. He overdoses on his ego and then does something very stupid. 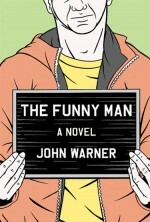 He’s charged with manslaughter, and pleads “not guilty by reason of celebrity.” Warner offers a blistering critique of American celebrity culture but remembers to make us laugh. If a younger, tougher Larry David wrote a novel, it would be this book.